← HELK Installation and Configuration – A Hunting I Will Go! My last SLAE assignment #5 solution is my Metasploit exec analysis. One more shellcode to analyze, and one more tool to use. In this case, I will be analyzing the exec shellcode using libemu. For more information on installation and configuration, you can see my earlier blog post. I was originally planning on analyzing the chmod shellcode, but I ran into a few issues. It turns out that libemu chokes/breaks on a lot of the Metasploit payloads. If you have any ideas what might cause this, then I'd love to know! Since I've already written my bind/reverse shells, I figured execve is good enough to show off some libemu usage. For the exec payload, we just need to set a file to change and the file mode. In this case, I decided to cat /etc/passwd, similar to my earlier post. With my options selected, I generated the payload that I wanted. Next, I added the payload to my wrapper program and executed. As usual, the shellcode length is incorrect due to null bytes. That said, the passwd file properly printed! First, I ran the shellcode through libemu's sctest binary. 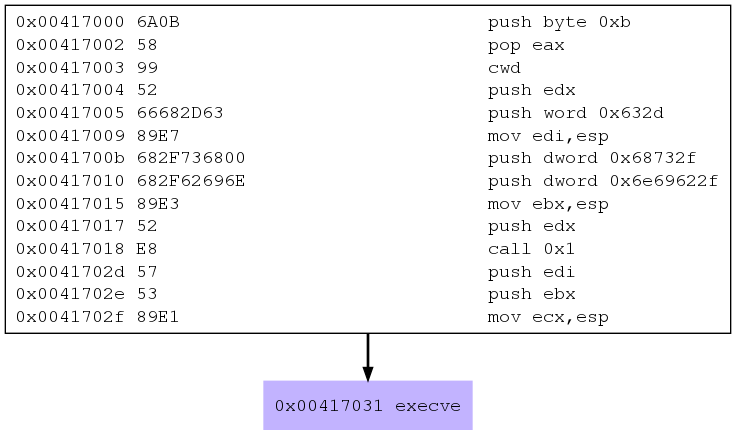 The -vvv flag increases the verbosity, -S reads the shellcode from stdin, -s runs the code up to 100k steps, and -G outputs the call graph to a dot file. As you can see, Libemu tracks operation execution, and the state of each register. The following instructions get the registers ready for the system call. As you can see, the registers are all properly set before the program executes the syscall. To verify this, I also ran a quick strace on my binary. Once the execution is complete, libemu begins generating the dot file. Finally, libemu also generates some pseudo-code! This is incredibly handy to see the program and methods. Additionally, it is useful for converting shellcode back into an actual C program. As you can see, libemu also generates an awesome little control flow graph! While this one isn't super complex, they can get pretty in-depth. In the case of this shellcode, there were five null bytes. Three were for the relative call, one was in the /bin/sh string, and one was at the end of /etc/passwd. Unfortunately, I ended up increasing the length of the shellcode by two bytes. This was due to the JMP-CALL gadget adding one byte, and my null termination of /etc/passwd adding another. You can find my version of the shellcode below. I wish libemu worked on more of the Metasploit shellcodes, but this is still a great tool to use. This concludes assignment #5, so only two more to go! Next week is polymorphic shellcode, so back to at least modifying some assembly.